A Day Driving Down Australia's Great Ocean Road. Simply Stunning! Travel Family 'Round The World An Incredible Drive Down the Great Ocean Road. Simply Stunning! The Twelve Apostles located along the Great Ocean Road in Australia. After picking up the car shortly after ten in the morning on Thursday we began our drive south to Geelong. Geelong sits about an hour south of Melbourne and we chose it as a stopping point before getting out on the Great Ocean Road. Once we got out of the city, it was pure traffic all the way to Geelong. A drive that should have taken about an hour stretched out to nearly two. Upon arriving we checked out a couple of holiday parks and had some lunch. We wanted to get some rest so we could start out Friday bright and early. We left Geelong early on Friday morning to get started on the Great Ocean Road. Some people take days to cross the 200km long stretch of highway, but we only had one day due to lack of accomodation. You see, we are finding out quickly how hard it is to find a place to stay on short notice during the height of the Australian summer. We couldn’t find any available place to stay until Portland which lies at the end of the road. Hopetoun Falls located off of the Great Ocean Road. The Great Ocean Road winds along cliffsides for most of the journey, so we knew that it would be scenic if nothing else. Our first stop came not far outside Geelong at the Split Point Lighthouse. As the name implies it sits where two points meet on the coastline. I was hoping it would be open for touring, but we had no such luck. Without being able to go inside, we took a short tour around the property and got back on the Great Ocean Road! Around forty minutes later we came across a carpark leading to the first of three waterfalls that we would see on this day. The Sheoak Falls sit about 15 minutes from the carpark, via a rough trail through a river bed and bush. When we finally reached the spot, I had to look around a bit to make sure we were in the right place. Unfortunately we were and had to accept that the falls weren’t much more than a trickle. We have seen plenty of spectacular falls in the past month so I don’t have much to complain about. After leaving the Sheoak Falls we drove around another hour to the Great Otway National Park. We left the main road for a bit in order to take in a couple of the park’s neater locales. The first was a 12km drive through the rainforest on an unsealed road known as Turtons Track. Following the road we approached the carpark for Beauchamp Falls. This time the hike was around 30 minutes each way. Along the way, Shawn Reece cut his finger and started to bleed, but I was able to patch it up quickly by making a bandage out of a leaf! Luckily, in the end it was worth it and these falls were much healthier. Otway Fly Tree Walk along the Great Ocean Road. Following Beauchamp Falls we drove to Hopetoun Falls about five minutes away. Given the choice of viewing the falls from the carpark or hiking forty minutes to see them from the bottom, we chose to take a short glance from above before moving on to the Otway Fly Tree Top Walk. I was able to indulge my inner child by doing another one of those things that I always have wanted to do. By the time we left the forest walk our schedule was a little backed up. We had to get to our hotel by 8pm, so we needed to get going. We only ended up stopping in one more place along the Great Ocean Road. 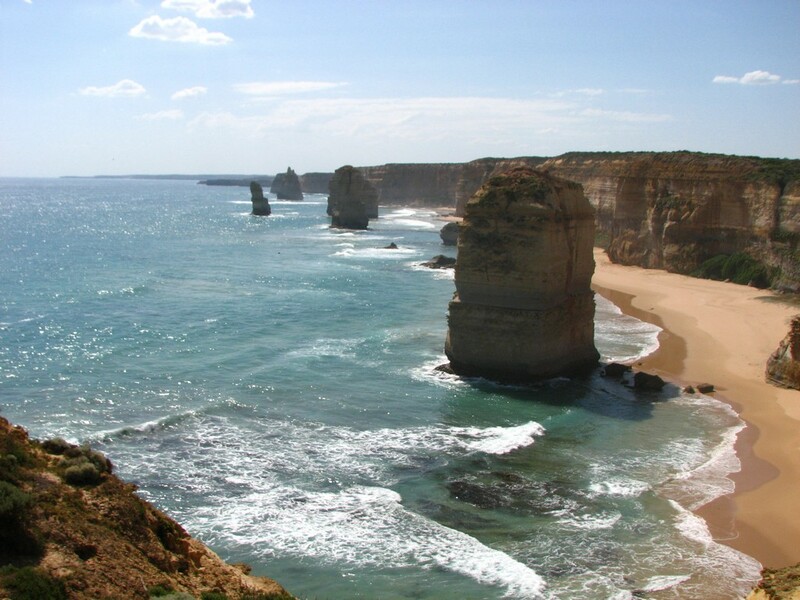 The Twelve Apostles are groups of massive limestone islands that lay stranded out in the ocean. The Apostles are former parts of the cliffside that for some reason, didn’t erode over time. By the time we reached them, the temperature outside was, well hot! As soon as we exited the car, flies started to attack us. The flies here in Australia are incredibly aggressive and there is no way to escape them. Even though the bug spray worked a bit, it didn’t work as well as I would have liked and they bothered all of us tremendously. In order not to go crazy, we hiked out to the Apostles and back as quickly as possible. This was a shame because the scenery was spectacular. It is among the best we have seen on the whole trip. Simply stunning! After leaving the Apostles we had another two hours to go on the Great Ocean Road before we reached Portland. Once in town we checked into the hotel and got some dinner. This is prime tourist season here and everything seems to be bursting at the seams with tourists. We are learning to deal with the massive crowds everywhere. 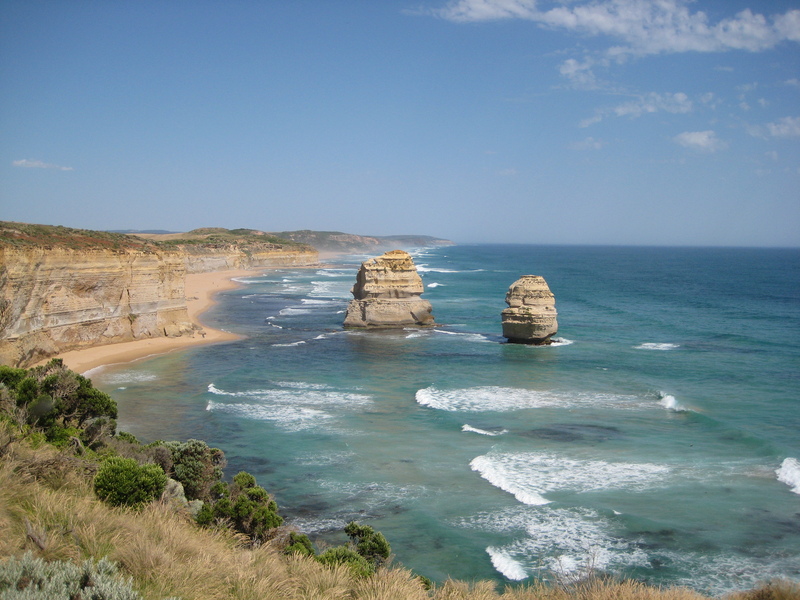 The Great Ocean Road sure reminded us of how enjoyable it can be to get out of the citites. Previous articleA Great Sprawling Metropolis! Next articlePesky Flies, Blowholes & One Giant Lobster!